A guide to absolute pressure measurement including explanations, applications and choice of products for measuring pressure with an absolute pressure reference. Absolute pressure is a particular type of pressure measurement which is always referred to a perfect vacuum. Absolute pressure ranges are often labelled with an ‘abs’ or ‘a’ suffix to the pressure units proceeding a pressure value, e.g. 1013.25 mbar abs or 1013.25 mbara. View detailed information pages for instrumentation used to measure absolute pressure. Waterproof Absolute Pressure Sensors- Waterproof absolute pressure sensors with absolute reference ranges for monitoring underwater pipe pressures or water depth/level in applications where it is not possible or less practical to provide a vented reference for atmospheric pressure compensation. Absolute Pressure Transmitters- Absolute pressure transmitters generate a 4mA output signal when the pressure corresponds to a perfect vacuum. Absolute Reference, Volts Signal Output Pressure Transducers- Absolute reference pressure transducers with high voltage output signals for measuring the total pressure a perfect vacuum pressure reference. Absolute Reference Pressure Gauges- Absolute pressure gauges for measuring pressure relative to a perfect vacuum. Absolute reference pressure gauges are used in applications where a system pressure is not influenced by changes in atmospheric pressure. Absolute Pressure Sensors- Find a pressure transducer or transmitter for measuring absolute pressures with a millivolt, amplified voltage, current loop or digital output. Absolute range pressure transmitters with a 4 to 20mA current loop output signal for measuring total pressures with reference to perfect vacuum. Amplified output absolute pressure transducers with 0-5, 1-5, 0-10, 1-10 volt signal outputs for measuring pressures from absolute zero vacuum. Absolute reference pressure sensors with strain gauge millivolt output signals for measuring pressures relative to zero vacuum pressure. Absolute reference digital pressure sensors with RS485, RS232 and USB interfaces for connecting to desktop and laptop PC computers. Choose an absolute pressure gauge for displaying absolute reference pressure readings. Select absolute pressure loggers for recording absolute reference pressure trends. 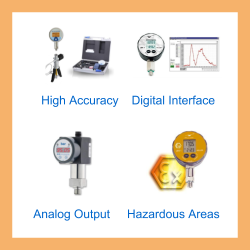 Find an absolute pressure calibrator for testing and checking the performance of absolute pressure measurement instrumentation. A very common example of measuring absolute pressure is using an Aneroid Barometer to measure atmospheric pressure. Inside an Aneroid Barometer there is a hollow flexible capsule which has a high vacuum sealed inside. As the atmospheric pressure rises and falls the differential pressure between the inside and outside of the capsule causes it to expand and contract. The expansion and contraction of the capsule is transferred into a mechanical movement by coupling it to a mechanism which moves a needle on a calibrated dial, scaled to read barometric pressure. 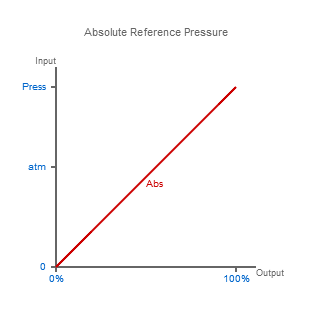 Another practical example of how an absolute reference is used, is the absolute pressure sensor. The manufacturer will seal a high vacuum behind the sensing diaphragm so that the total pressure can be measured on the positive side of the diaphragm independently of the outside atmospheric air pressure. If the pressure connection of an absolute pressure sensor is vented to ambient air pressure it will then be measuring the barometric pressure in a similar way to the Aneroid Barometer. Absolute pressure is measured in many applications where the changes in atmospheric pressure have no influence on the measurements. For example when leak testing a solid walled vessel over a long period of time the total pressure inside should remain constant independent of the changing atmospheric pressure outside the vessel. Therefore a pressure sensor or instrument with an absolute pressure reference would be the most appropriate choice for leak testing purposes. 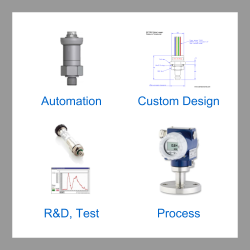 Articles with more information on absolute pressure measurement products & applications. How do you determine the zero absolute pressure measurement reading if you cannot apply a high vacuum during calibration? If it’s not possible to apply a sufficient high vacuum to directly calibrate zero absolute pressure, then an extrapolation method has to be used instead to best determine the measurement reading. The way to extrapolate the zero reading for an absolute pressure measurement device, is to plot a series of calibration points from say 10…100% range, of the reference pressure against readings taken from the device under test. Then calculate the best straight line through all the points. There are various methods to calculate the best straight line, but least sum square linear regression is a common one to use. The closer the minimum calibration point is to zero, the more precise will be the determination of the reading at zero absolute pressure. The extrapolated zero pressure reading is the point where the best straight line intersects with zero absolute pressure. Why is it called “absolute” pressure? It refers to the fact that the reference is fixed at the lowest possible pressure, a perfect vacuum, so that the pressure reading is always compared to an independent and unchanging reference. How do you convert a gauge pressure to an absolute one? If you know the local ambient air pressure, the absolute pressure can be determined by adding it to the gauge pressure, i.e. P (abs) = P (atm) + P (gauge). Does a changes in ambient air pressure affect an absolute pressure reading? It does not change the reference of an absolute pressure measuring device, but it may affect the pressure reading depending on whether the measured pressure is influenced by changes in ambient air pressure or not. Can a differential pressure transmitter be converted to measure an absolute pressure? Yes, it can be modified by evacuating the negative side pressure port and sealing the vacuum inside, although before attempting this the manufacturer should be consulted first to ascertain whether it is ok to apply a high vacuum to the device. Some devices maybe affected by high vacuums, for example those with an oil filled capsule on the negative side may drift due to outgassing of the oil. Also the vacuum maybe spoiled over time due to the internal material surfaces outgas particularly at higher temperatures. The absolute reference should be checked regularly to ensure a stable reference. Can water depth be measured using an absolute pressure sensor if a vented reference is not possible? Yes, however the depth of water will need to be compensated by obtaining a reading for local air pressure independently. Also the accuracy of depth measurement will be degraded, more so at low ranges due to the combination of errors from two measurements. Are absolute pressure ranges used only for measuring vacuum? No, absolute refers to a perfect vacuum reference and the range can be any value within or beyond the vacuum range. Is a barometric pressure an absolute reading? Yes, barometric pressure or atmospheric pressure is measured with respect to a perfect vacuum. Why is an absolute pressure transducer more expensive than a gauge reference equivalent? The quantity produced compared to gauge reference devices are much less and therefore the costs of manufacture per device are higher. The design of the sensing element is more complex than a gauge reference version. Extra production procedures must be carried out to evacuate and seal the vacuum reference. I have a pressure gauge which is connected to a gas tank and it reads 107.6 kPa. The atmospheric pressure at my location is 96.4 kPa. How do I determine the absolute pressure of the gas in the tank? If the pressure gauge reads zero when vented to atmosphere it is likely to be a gauge referenced device and therefore the absolute reading will be the sum of the atmospheric and the tank gas pressure reading, which in this case will be 204 kPa absolute. If the pressure gauge reads atmospheric pressure when vented to atmosphere it is an absolute referenced device and therefore the absolute reading will be the same as the reading on the gauge, which in this case is 107.6 kPa absolute. If the pressure gauge does not read zero or atmospheric pressure when vented to atmosphere, subtract the readings between when the gauge is vented and when it is connected to the tank. To determine the absolute pressure reading of the tank, add this difference to the atmospheric pressure reading if the difference is a positive value, or subtract it from the atmospheric pressure if it is negative value. How do you calibrate the zero reading for an absolute pressure measuring device? In most situations it is not possible to generate a high enough vacuum due to the limitations of the available vacuum pump, so instead the zero reading must be extrapolated. To avoid introducing span errors the vacuum should be less than 10% of the vacuum range being calibrated. I have a hydraulic pressure sensor with a pressure range marked as 1000 psia. Is it possible to pull a vacuum on this type of sensor and if you did what would it read? Would it be zero? PSIA means a “psi absolute” range. Generally absolute ranges are compatible with vacuum pressure because they measuring the pressure relative to a perfect vacuum. So yes, if it was a perfectly accurate pressure sensor it would read zero when a perfect vacuum is applied. Unless the device has a lower limit marked on the body of the device, it should have the capability to measure a vacuum. However in this case the vacuum part of the range would only be ~15/1000th of the total 1000 psi range, so the measurement sensitivity and accuracy over the vacuum range is not going to be very good. Send us your enquiry for a product associated with this Absolute Pressure page, and get assistance with selecting a product for your application.